RIR takes a trip back in time to uncover the history of smoking in Russia and the changing attitudes to the habit - which often depended on whether the country’s ruler was a smoker or not. On June 1, 2014, a law came into force banning smoking in all public places in Russia, including trains, hotels, cafes, and playgrounds. The ban has polarized opinion, with the country divided on whether it represents progress or an assault on the rights of the individual. However, this is not the first time smoking has effectively been outlawed in public. In fact, the debate over tobacco goes all the way back to the 16th century. The first drag ever taken on a cigarette taken ​​in Russia was at the court of Ivan the Terrible, and it went like this. In 1553, an English trade ship, caught in a storm, was forced to anchor off the Russian coast. The ship carried on board, among other goods, tobacco. The Russians tried it and liked it. They did everything with it: smoked it, chewed it, sniffed it, and made an alcoholic infusion with tobacco that literally knocked them off their feet. They clearly relished the novelty. But half a century later, the first bans on tobacco potions appeared. It was believed that smoking was ungodly because smoke was generally associated with evil spirits. Smoking could be punished by exile to Siberia, having one’s nostrils torn open, and having one’s lips cut off. But apparently, these punishments were not enforced diligently enough, since Russians continued to smoke. Everything changed with Peter the Great. The young tsar, never without a pipe in his mouth, began to teach Russians to smoke persistently and purposefully. He even managed to benefit from it. He sold the monopoly rights on the tobacco trade in Russia to the English (although for only seven years) for 200,000 pounds, which at the time was a huge amount of money. Access to the Russian market was expensive. The tsar put the money to good use, funding the army, the navy, and employing foreign experts. He also personally began to actively enforce smoking among the Russian nobility. At the time, smoking was done through long-stemmed clay pipes which were first imported, then produced in Russia. The tobacco was imported from America and Turkey. Ordinary citizens, unlike the nobility, chewed and sniffed tobacco more often than smoking it. Smoking in public places was banned, while chewing and sniffing was not. By the mid-18th century, snuff boxes, ranging from simple wooden ones to those decorated with enamel and stones, became part of Russian life. Empress Catherine II loved sniffing tobacco. She always took it out of her snuffbox with her left hand because her right hand was for being kissed and signing decrees – for deploying orders for the Russian tobacco industry, for example. It was during her rule that American tobacco began to be sown and the first Russian tobacco growers were given the right to tax-free trade - both for imports and inside the country. It is no wonder that tobacco fell in price and became even more widespread in use. By the 19th century, people smoked everywhere: at home, in restaurants, at clubs, and in tobacco shops. A journalist in 1840 was horrified: “Now not only secular dandies smoke tobacco, but also the ladies! Oh the horror! Ladies smoking tobacco!” Not only that, but doctors in first half of the 19th century prescribed smoking to improve vision, memory, and to clarify memory and calm the nerves! At the same time, however, patches and pills appeared in Russia for those who wished to quit smoking. They were advertised in newspapers and magazines, often on the same page as advertisements for new cigarettes and tobaccos. View the infographic: Will Russia's new law reduce smoking or not? Under Tsar Nicholas I, who did not smoke and did not favor smokers, smoking was banned in the streets, squares, and public places. His son, Alexander II, a heavy smoker, overturned his father’s bans and allowed the free sale of tobacco, cigarettes, and cigars once more. 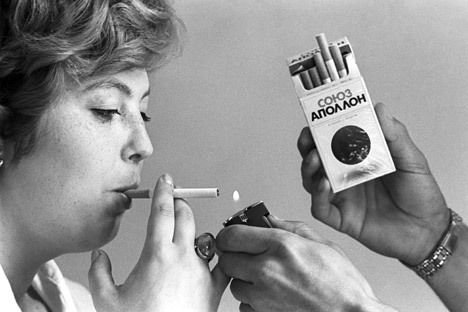 Cigarettes became part of the lifestyle of Russian schoolboys, officers, officials, and the newly emancipated women. They bought them rolled or stuffed and rolled them up themselves, either manually or by using special machines. Fyodor Dostoyevsky would smoke one hand-rolled cigarette after another while he wrote. On his desk was a box of tobacco and a box with rolling papers and cotton filters. The last three Russian monarchs were smokers: Alexander II, his son Alexander III, and grandson Nicholas II. The “Tobacco Capital” of Russia was, of course, St. Petersburg. By 1913, there were many factories here which produced 80 percent of all the country’s tobacco. At the beginning of the 1930s, tobacco production was adjusted and the first cigarettes appeared. In 1937, Belomor cigarettes were produced, named in honor of the White Sea – Baltic Canal, originally named after Stalin and built mostly by prisoners. Once again the flourishing of the tobacco industry coincided with a smoker being in power. At the start of the Second World War, tobacco supplies decreased as demand grew, and low quality cigarettes with very strong tobacco began to appear. People called such cigarettes “Eye Gouges,” or “Death to the Fascists”. Soviets smoked everywhere: at work and at home, in cafes and restaurants. Writers, artists, movie stars, and even cartoon characters smoked. The head of state, Leonid Brezhnev himself, smoked, although he did not advertise it. When doctors limited Brezhnev’s smoking, he got himself a cigarette case with a timer that opened no more than once every 45 minutes. In the 1980s, the country was gripped by a shortage. Buying cigarettes required standing in huge lines for many hours, and markets began selling cigarette butts. Again, speculation flourished: Marlboros or Kents could be bought at exorbitant prices - not in stores, but at railway stations or in the restrooms of hotels where foreigners were staying. However, this only lasted a few years. By the early 1990s, many Russian tobacco factories had been purchased by global giants of the tobacco industry, and the shortage was eliminated. Since then, all of the world’s leading cigarette brands can be purchased freely in Russia, but most of them are produced in Russia under license.